Drivers are truck-driving workers in Mario's Cement Factory. Only two of them are seen in the Game & Watch game and its re-releases. Mario's task in the game is to open the hopper lids in the cement to let the cement land inside the trucks, but if Mario is not careful, the cement containers can overload and dump cement on a driver. The driver then falls out of the truck window injured, causing Mario to get a miss. 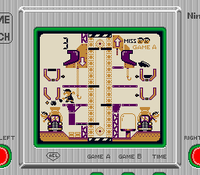 The drivers first appear in Mario's Cement Factory, by being somewhat involved in gameplay. They appear by taking out their heads to the external sides of the screen. They are exposed to the risk of being injured by the cement, and if they are injured by the cement the player get a miss. A driver from this version serves as a alarm function by ringing a bell with a drumstick. In this re-release of Mario's Cement Factory the drivers have exactly the same behavior from its first appearance, the only difference is that in this version they take out their heads to the internal sides of the screen. The drivers reappear in Cement Factory, which is included in this compilation. They have similar traits from the Tabletop Version of Mario's Cement Factory. The drivers reappear in Mario's Cement Factory's port, in here they have exactly the same behavior from the New Wide Screen version. This page was last edited on April 17, 2019, at 20:08.